Category Note: An 100% run involves beating every dungeon and achieving an A ending. Note about the 100% run: There is a save and load because the game freezes otherwise. Read the comments for more information. Best B ending time on Easy mode: Single-segment 0:52:20 by Josh 'funkdoc' Ballard on 2014-08-24. Best A ending time: Single-segment 2:27:47 by Josh 'funkdoc' Ballard on 2014-08-18. Best 100% time: Single-segment 4:29 by 'もか' (Moka) on 2009-05-08. Best Seraphic Gate time: Single-segment 0:15:43 by Kevin 'Enhasa' Juang on 2007-05-01. Single-segment B ending: Easy mode: 0:52:20 by Josh Ballard. This was the first speedrun I ever submitted to SDA, and I never expected to return to it. I first worked on this in late 2005, then improved it in late 2006. I figured it was optimized at that point, but I recently saw the Japanese WR on this category and changed my mind. Between new tricks and a better PS2 I was able to save more than 3 and a half minutes from my old run, which was far more than I ever expected! First off, I use a 77001 model PS2. My old runs used a fat PS2, and all of those have longer load times for this game and experience much more slowdown with many sprites on the screen. The 77000 and 90000 series are the best PS2 models for speedrunning this game and some others (e.g. Final Fantasy IX). That's probably one of the biggest improvements right there! There isn't a ton to say about the 30+ minute intro, obviously. The first battle with the harpy is one of the bigger luck elements in the game, however, since she likes to block quite a bit. I was willing to accept her blocking once, but got perfect luck in this run! Pay attention to when I attack with Arngrim after Lawfer – I find that the timing used in these new runs seems to reduce her blocking rate. At the start of the first dungeon, I buy 4 Two-Handed Swords and perform a series of transmutations to turn those into Holy Gems, while also selling all of my starting items. Holy Gems are the fastest way to defeat the first boss, as they deal a bunch of damage and have the quickest animation of all the magic gems. Clearing my inventory makes it much quicker for me to use the items I need, and is an idea that came from the Japanese speedrunners. This dungeon makes for a pretty good introduction to this game's platforming, most of which should be easy to understand. Sliding near a ledge gives you a major momentum boost when falling forward, hence why I jump onto frozen enemies and do that. Slides can also be canceled by tapping a direction; it's not worth it to constantly cancel slides, but they are good when exiting rooms and can also cancel the recovery from a long fall. After the self-explanatory boss battle, you must open the chests with artifacts in order to complete the dungeon. I keep both artifacts simply because it's faster than giving them to Odin. After the first dungeon I skip the rest of the game until Chapter 5, which sees one of the main improvements over my old run. savo ten, the Japanese runner referenced before, showed that you can transfer a level 3 Jelanda and get Guard Reinforce from Odin! This can be turned into Spell Reinforce, which nearly doubles the damage of my Poison Crystals and is a must for the final boss. Jelanda needs 75 Hero Value and some expensive equipment on her in order to score well enough for this to work, but that doesn't take much time. I used to fight an extra battle in the final dungeon for a Spell Reinforce drop, so this is faster AND cuts out RNG! All characters need an Angel Curio equipped. This accessory prevents you from dying but has a 30% chance of breaking when you lose all HP, and it is a must with my underleveled characters. My fighters get Stun Checks to prevent being dizzied and reduce fire damage, and Jelanda gets a Fairy Ring to reduce her Charge Time (allowing her to act again right after casting Spell Reinforce). Jelanda also gets a Supreme Garland to protect against dizzying, since she can't afford to use a Stun Check. Arngrim's weapon is removed so that he always deals maximum damage with Poison Crystals – this works because without a weapon your "Random" stat is reduced to 0. I need a bunch of Lucid Potions and Poison Crystals, the latter of which are acquired by transmutating Halberds. Lucid Potions make you invisible, meaning that enemies can't target you; if the entire party is invisible, enemies can only hit you with FMV spells. The effect is lost if you use a normal attack, but you can still use items and cast spells from the menu. Thus, you can protect yourself then nearly double your Poison Crystals' damage via Spell Reinforce. Poison Crystals are the strongest & quickest of all the magic items, making them an easy choice here. Finally, I transform an Ether Scepter into a Tome of Alchemy, which is used to win the one unavoidable fight in this dungeon. One more thing...there is a newly discovered glitch (thank you, Japan!) that allows me to defeat the final boss without healing! There is a sword called the Scarlet Forge which absorbs fire damage. If you give this sword to someone then put that character in the back row, the ENTIRE PARTY gets the "Absorb Fire" effect! Since I hide behind Lucid Potions, Surt can only attack with the Ifrit Caress spell...which ends up healing everyone! Lenneth is the only character in this run who can use this weapon, so into the back she goes. So after all the menus, the final dungeon itself is arguably the toughest in the entire game in terms of platforming, especially due to this game's inconsistent controls. Specifically, when loading a new room or series of rooms, the game will often delay your inputs or even drop them altogether! I have to compensate by waiting a second or so in certain rooms before doing anything. Factoring that in, this all goes very well. Of particular note here is a new skip discovered by savo ten, which allows me to avoid fighting the two tall Vanir enemies with icicles around them. Those icicles thwarted all of my attempts to dodge them, but he showed me that you can damage boost over them with the method seen in this run. It's very easy too, just make sure you move forward a tad and do a short jump! Last thing to note here is the giant golem enemy, who is unavoidable. A Tome of Alchemy is used to win the fight instantly – you can save a few seconds by running away, but that will cost you time even if it fails once. Safe strats! I already explained the final boss strategy above, more or less. Survive the first attack without anyone dead or dizzied, use Lucid Potions on everyone, then Spell Reinforce and spam him with 11k damage Poison Crystals. And thanks to the Scarlet Forge glitch, you'll never get hurt again after using the first round of potions. You just don't get great weapons or even a 4th character in this category, so it is unfortunately fastest to attack him with nothing but Poison Crystals. This is why I have worked on a "No Lucid Potions/Crystals" category for this ending, as I find that to be much more fun to play and interesting to watch. Overall, barring any new glitches, this run is almost as tightly optimized as you can get with a JRPG. I had great luck and only a couple very minor execution errors, which is no mean feat with this game's controls. I think this time I can say I am done with this one! Wally Jenkins – for figuring out the Spell Reinforce + Poison Crystal stuff years ago! savo ten – Japanese speedrunner who holds that version's WR on this category (look him up on Youtube!). Taught me about clearing the inventory, using Holy Gems, transferring Jelanda for Spell Reinforce, the damage boosts over the Vanir, and the Scarlet Forge glitch! Moka (mokapuyo on Youtube) – another Japanese speedrunner who helped me choose a PS2. Tri-Ace – for making my favorite video game of all time. Even if you aren't the same these days, at least you have something to point to! My stream viewers – for making it fun to sit through the intro over and over again! If you enjoyed this, please check out my stream at http://www.twitch.tv/srkfunkdoc where I am constantly working on new categories for this game! Single-segment A ending: 2:27:47 by Josh Ballard. Back in 2008, after I finished my original A Ending speedrun on this game, I had said that it would be my last one. Then the charity events started happening and I found countless other games I enjoyed running (and some I didn't enjoy! )...but more than 6 years later I have come back to the place I started. This run always stood out to me as more improvable than my old B Ending run, as it's a more complex category and I knew I could afford to skip some of the items I used back then, but I was not expecting to save over 8 minutes in real time! I will explain the strategy of this run and note areas of improvement as they show up. There isn't a ton to say about the 30+ minute intro, obviously. The first battle with the harpy is one of the bigger luck elements in the game, however, since she likes to block quite a bit. My policy here was to reset if the harpy blocked 3 times, but luckily this run didn't come close to that! Pay attention to when I attack with Arngrim after Lawfer – I find that the timing used in these new runs seems to reduce her blocking rate. At the start of the first dungeon, I buy 8 Two-Handed Swords and perform a series of transmutations to turn those into Holy Gems, while also selling all of my starting items. Holy Gems are the fastest way to defeat the first boss and Lezard, as they deal a bunch of damage and have the quickest animation of all the magic gems. Clearing my inventory makes it much quicker for me to use the items I need, and is an idea that came from the Japanese speedrunners. This dungeon makes for a pretty good introduction to this game's platforming, most of which should be easy to understand. Sliding near a ledge gives you a major momentum boost when falling forward, hence why I jump onto frozen enemies and do that. Slides can also be canceled by tapping a direction; it's not worth it to constantly cancel slides, but they are good when exiting rooms and can also cancel the recovery from a long fall. The room before the save point is a bit tricky, but fine as long as you jump up the ladder quickly enough to dodge the enemy above. After the self-explanatory boss battle, you must open the chests with artifacts in order to complete the dungeon. I keep both artifacts because it's faster than giving them to Odin, and also because I will need one of those artifacts for later. After the first dungeon, I use the EXP Orb to level up Jelanda and raise her Hero Value. This drastically improves her rating with Odin when I send her up to Asgard, meaning I get more items from him! This transfer nets me a Fire Lance spell in Chapter 1 and a Shadow Servant spell in Chapter 2, along with lots of Element and Ether Scepters over the course of the game. Element Scepters are useful because you can turn them into Tomes of Alchemy, which instantly kill normal enemies – the Ch.1 transfer means I have 3 of them for Tower of Lezard, which is the exact amount I need to safely get through that dungeon. Ether Scepters are the 2nd strongest weapon for mages in the normal game and can cast Great Magic (the big FMV spells that hurt a ton), but they have a 50% chance of breaking whenever you cast Great Magic. A surplus of those is a major benefit for this run! After transferring Jelanda, I skip the rest of the game until Tower of Lezard. I used to get the Guts skill in this run, but it's only ever relevant vs. Loki and that fight still has a decent success rate without it. I probably save a couple minutes from skipping it! The Lezard fight is tricky because of his Dragon-Tooth Warriors. Upon death, they "possess" Lezard, which doubles his max HP and boosts his stats. Using a Tome of Alchemy gets around this because it doesn't technically "kill" them – it merely turns them into EXP crystals! That leaves Lezard a total wimp who dies to 4 Holy Gems. This is also an improvement, as I used a full combo with multiple PWS ("super") attacks before. I made sure to equip Angel Curios before the fight, as they are one of the most important accessories in the game. They prevent you from dying but have a 30% chance of breaking whenever you lose all your HP, and are a must in speedruns with your underleveled characters. Everyone will have an Angel Curio equipped for all remaining fights in the game now; equipping 2 is pointless since you lose both of them if one breaks! After this dungeon, get ready for over an hour of required plot events to get the A Ending! My strategy here completely avoids Freya's warning, which is the first step in the bad ending. You get the warning if you leave a town or dungeon with your Evaluation rating at 25 or lower. If Lenneth keeps the Nibelungen Ring equipped through all of Disc 1 and you transfer Jelanda in Chapter 1, you will enter Chapter 5 with exactly 25 evaluation. This means I can go to the menu and give an artifact to Odin, which increases Evaluation by 1, and dodge the warning. This is important because the later cutscenes involving Lucian & Loki can trigger the bad ending if you got the warning, but they can't trigger the warning itself. This leaves me safe for the rest of the game! I also visit Brahms Castle in this chapter, which is another improvement. I used to go here before Tower of Lezard and pick up the Beast Slayer sword, which is an instant kill on manticores. The new manticore skip made this unnecessary, so now I just take the shortest route through the castle. This makes the world map route more tightly optimized as well. One final thing worth noting in this chapter is that transferring Lucian here earns you a Guard Reinforce spell, which you can turn into Spell Reinforce. Spell Reinforce nearly doubles the entire party's magic power for 10 turns, which is key since my final boss strategies rely heavily on magic damage. It works not only on mages' spells but also on items that cast spells, which is relevant later. After Chapter 5 I skip the rest of the game until Chapter 8, then perform a complex series of menus to prepare my party for Bloodbane. Lenneth has her weapon removed since this guarantees she deals the maximum damage with magic items (reduces a stat called Random to 0), while the other characters need their best available weapons for Hrist & Bloodbane. Everyone gets Angel Curios, Lenneth doesn't need a 2nd accessory, Arngrim gets a Power Bangle (attack +30%) for the Hrist fight, and the mages get Magic Bangles (magic + 30%). I also give Lenneth some armor to aid in blocking & dodging Loki's attacks, and Arngrim gets a new pair of boots to guarantee that he dodges Hrist's attack combo (which takes FOREVER). I also teach Fire Lance & Spell Reinforce to Mystina and Shadow Servant to Lorenta, and set their attack spells appropriately. Shadow Servant is used because its Great Magic is just as powerful as Mystic Cross's, but its animation is roughly 5 seconds shorter. Finally, I buy a bunch of items to prepare for the final bosses. I get 20 Halberds and turn those into Poison Crystals, and also buy Lucid Potions and Charge Breaks. These will be explained shortly. After the longest series of cutscenes in the game and a quick plot battle with Hrist, it's time for Asgard Hill! The dungeon itself is rather simple, until we get to Bloodbane. The idea here is to use Lucid Potions on everyone ASAP. These potions make you invisible, meaning you cannot be targeted by enemies; if the entire party is invisible, the only attacks that can hit you are Great Magic spells! You lose the effect by performing a normal attack, but you can still use items and cast spells from the menu. Thus, after using the potions, I cast Spell Reinforce and use a Charge Break on Mystina. Casting spells and using PWS's leaves you with varying amounts of Charge Time, and you cannot perform another spell/PWS (or do ANYTHING with mages) until all CT is gone. Charge Breaks instantly remove all CT at the expense of some HP, so Mystina can get to attacking immediately after the spell. Poison Crystals are the strongest & quickest of all magic items, and Spell Reinforce nearly doubles their damage. This means I can safely pelt the boss with crystals until it's time to finish him in one combo, which is also helped greatly by Spell Reinforce! Bloodbane's physical defense is much higher than his magic defense, which is why I prefer this strategy. Fenrir has very similar stats to Bloodbane's and requires a similar strategy. The difference here is that Fenrir has an elemental weakness to fire, so I use Fire Lance with both of my mages. I also equip Freeze Checks (prevent freeze) on my two fighters since that is a risk with this boss, and give Arngrim the sword I got from Bloodbane since he'll need it for the last boss. You need good timing on the first Great Magic spell here since it only builds 20 meter – wait too long and you won't be able to chain a second one! After Fenrir are the toughest enemy dodges in this run. The first room features a flying wraith who loves to block your path on the hill. I try to jump and draw his attention to the left, which works out well. The room after that requires me to immediately run left and slide under another wraith, which is scary due to this game's controls. On occasion, when loading a new room or series of rooms, the game will give you input delay or even drop your inputs altogether! I have gotten a jump instead of a slide there, and it's quite painful to lose this long of a run to that! There is also another room with a floating eye who can block your path like the first wraith does, but that's not as much of a problem. Survive all that, and it's time for Loki. Lenneth is your main damage-dealer in this fight, so the focus is on buffing your party and debuffing Loki as much as possible. I swap out the mages' Magic Bangles for Fairy Rings, which reduce their Charge Time and allow them to act on the next turn after casting Spell Reinforce and Sap Guard. I also give Lenneth a Power Bangle to up her damage, switch the mages' attack spells back to Shadow Servant & Mystic Cross, and buy more Lucid Potions along with a couple Might Potions. Might Potions nearly double your attack power but only last for 2 turns, so they are a fine substitute for Might Reinforce here. Finally, Arngrim gets a Stun Check to prevent him from getting dizzied, which works since a Power Bangle on him doesn't really change the fight. The first Loki battle ends after 3 turns, so I use Lucid Potions and wait. After the world gets destroyed and rebuilt in the span of 5 minutes, it's time for the real fight! You want none of your characters to die or get dizzied from Loki's first attack. After surviving that, I use Lucid Potions on everyone again then prepare for the final combo. Sap Guard cuts an enemy's physical defense in half, which isn't so hot for Bloodbane/Fenrir (1000 physical defense) but is huge for Loki (3600 defense!). I use that and Spell Reinforce, and both of my fighters get Might Potions. Between these and Lenneth's new overpowered sword (Glance Reviver), I am able to wipe out Loki's entire lifebar in a single combo! Overall, I am more than satisfied with this run. A 2:28 is possible with better luck (mainly Yumei not showing up in Chapter 4's world map search), but this category is just awful to play due to the huge amount of cutscenes and lack of actual gameplay. I am glad to be done with this one! Enhasa – for being my original partner in crime on this game back in the day! Hope you're doing well, wherever you are...it's been too long, pal! Wally Jenkins – for figuring out the Spell Reinforce + Poison Crystal stuff years ago, along with this run's clever way around the bad ending! Tri-Ace Fanboy – for offering a lot of suggestions after seeing my old A Ending run. Years later, it finally paid off! savo ten – Japanese speedrunner who showed me how to jump over manticores! Search his name on Youtube for some great stuff. Moka (mokapuyo on Youtube) – another Japanese speedrunner who helped a lot in choosing a PS2. Also runs this category and uses a much different strategy (don't transfer anyone in Disc 1, transfer Lorenta in Chapter 7 and hope to get Gram). It's a lot more luck-based so I wouldn't consider it for this, but it's good in its own right and more interesting to watch! Tri-Ace – for making my favorite video game of all time. Not holding my breath for any new magic, but I don't need it when I have this! Frei, Lenneth, & Lezard – YES!!! Single-segment 100%: 4:29 by 'もか'. The Japanese version is better for running than the English version because it has shorter cutscenes. Therefore, if someone submits a run for the English version under the same conditions, I think it should be posted despite the slower time (a few minutes). By the way, there is no difference between the bosses in either version. 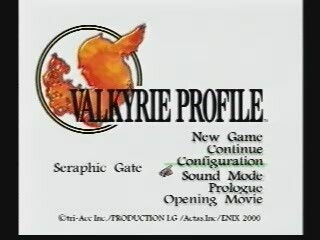 Valkyrie Profile has a lot of bugs. For this run, the most troublesome bug when the game always freezes in a fixed spot. The bug either happens in chapter 8 when I recruit Gandar, or in Asgard when the final event triggers. Either way, the game definitely freezes. Of course, during the time the game is turned off, I don't take a break and continue playing the game. This freeze bug is a software-related problem because it not only occurs on the PS2 (both the SCPH-70000 and SCPH-90000 models), but also on PS emulator (which doesn't have a physical cause like heat). Sliding right before switching between screens is an important trick, but in order to slide, you have to stop yourself. For me, this is too difficult, so I did not use this trick. I don't know if this information is helpful, but I used the analog stick for all of the platforming, yet only the d-pad can be used for fights and menus. Below is an explanation of parts of the run you wouldn't be able to understand just from watching the run. Though this is a single-segment run, if there is a situation that slows me down too much, then I reset and retry from the beginning. I run into a normal enemy by accident, if the order of "Belenus->Solde Catacombs" doesn't appear during my first spiritual concentration, or the Ethereal Scepter breaks during the chapter 4 Lezard battle. The reasoning behind the first spiritual concentration is that with the "Belenus->Solde Catacombs" pattern, the last concentration is the Cave of Oblivion. As a result I can reduce the number of times I use spiritual concentration. To give an example in Chapter 6, with the order of "Badrach -> Sunken Shrine -> Grey -> Lost City of Dipan -> Shiho -> Cave of Oblivion", you can cut the last two spiritual concentrations (Shiho -> Cave of Oblivion) from the list. I don't go inside the Cave of Oblivion because there is no record whether it is cleared or not. It's not neccessary to add everyone in my party for this run. These are the characters that can be used if you don't add anyone extra to your party: Lenneth, Arngrim, Jelanda, Kashell, Lorenta, Mystina, Lucian, and Gandar. Even though those characters seem like they would be enough, I actually need to transfer a lot of characters to Asgard to avoid a C ending. Also, recruiting Llewelyn in chapter 1 gives me a reliable strategy against bosses who guard frequently because his third attack, "Aiming Wisp", always hits (it's unblockable and never misses). Llewelyn makes the Salerno Academy Harpy battle and the Tombs of Amenti Akhetamen battle significantly easier. Brahms is a boss, but you can clear this dungeon without fighting him. In case if you want to fight Brahms, you can create a gem and use it to defeat him easily. I researched this dungeon thoroughly, and if you don't recruit Kashell in your party, Camille village won't be destroyed even if you visit it during the last chapter. If you want the people of Camille to live peacefully, then you shouldn't recruit Kashell in a normal playthrough. I don't enter Solde Catacombs, Salerno Academy, and the Dark Tower of Xervah during the chapters they appear. The reasons are listed below. Solde Catacombs has enemy symbols that definitely cannot be avoided. Collecting the dimension slip for this dungeon is necessary in order to save time. I can't kill the Salerno Academy boss in one turn without great magic. It's a good idea to have Lucian for earning purple gems in the Dark Tower of Xervah, he makes the boss battle more stable. After you clear the Forest of Spirits once, you can reenter and fight the boss again to collect a new artifact. However, collecting this artifact doesn't help save time, in fact, it makes the run slower. Usually you can't eject yourself outside by killing off your party when you defeat a boss because all of the enemies disappear. However, in the Tombs of Amenti, there is a trapped treasure chest containing an enemy that still exists even after defeating the boss. Although I understand death abuse is not preferable in SDA, I used it to avoid boredom (both watching and playing). I also believe this death abuse is a better technique for speedrunning than running through normally. Finally, from the bottom of my heart, I like to express my gratitude towards MT for introducing me to SDA, helping me with submitting, and various other support; Enhasa for assisting me before the translation project took place; and Mike for his great effort translating my Japanese comments into English. Single-segment Seraphic Gate 0:15:43 by Kevin Juang. First I would like to thank the SDA crew: Nate for encoding for me even though he didn't have to, Mike for being an awesome guy in general and a good friend, DJ because he don't get no respect, and Radix for being the godfather. Also I should thank my brother Michael for giving me his leveled up save file, Josh Ballard for his B run and the whispering of sweet nothings about A run, spineshark for inspiring me to actually finish because his frothing demand for this game was increasing, Captain K for his FAQ, the people at enixfans for their good info, tri-Ace Fanboy for reminding me of a couple obvious things, and everyone in the VP thread for their suggestions and support. Before I continue, I should bring up some background. I normally kill Gabriel Celeste in 1 PWS chain and kill Iseria Queen in 2 PWS chains. In this run, I have to tack on some extra hits after the 2nd PWS chain vs Iseria, which is similar to Josh's original B ending run vs Surt. This has led some people to believe that changing setups should actually save a turn. All I actually have to do to prevent this is to either get luckier (Lenneth using Guts), equip Lenneth with an Angel Curio (and thus needing to Charge Break), or to just throw in some attacks in one of the first turns. Now for the lame excuses part. This run uses a save file, but it's not perfect. You would ideally want to do things like luck manipulate all your Golden Eggs, Holy Drops, and level ups for max stats. If I ever got a "perfect" save file, I could redo this run to "perfection," but as is, it was hard to motivate myself since the run's potential was capped from the start. I originally wanted to do this run over a year ago, and being the fool I was, I thought I could download a save file from gamefaqs and this would take me a day at most. Well, not only did the save turn out to be hacked, even with crazy stats the run proved to be nontrivial, as this hacked team struggled to deal good damage without SG weapons. So then I spent small bits of time over the next year doing research until I finally got a 2 week block of free time. My goal was to finish the run as fast as possible so that I could mail spineshark my copy of the game so he could play it, and so I could play The Red Star. I spent the entire first week and a half failing attempts, waiting for TSS tourney matches on IRC, and not being able to find The Red Star in any stores whatsoever. Finally, as I was going to sleep one night, I checked the gamestop store locator and found one copy in a 50 mile radius from me. So I did what any reasonable idiot would do and stayed up all night, finishing past 6am. I play like, well, someone who has stayed up all night, but since I'm generally good at platformers, hopefully it still looks ok to you. Mike has his InFrequently Asked Questions, but here I have some AAQ (Actually Asked Questions), asked by friends, forum members, and verifiers. Q: How are you able to run through the enemies like that? -or- I thought you got the thing that lets you do that, IN the Seraphic Gate? A: The Dimension Slip lets you do this. The Unholy Terrors in SG can drop them, but you can also get them by transmuting Bark of the Dryad (from beating Nethov Swamp) with Creation Gem. Needless to say, this saves a tremendous amount of time. Q: Why do you pick up the event experience after Iseria Queen? You don't need it to leave. A: Getting the tri-Emblem signifies that the dungeon is beat; listen to the music change. You can leave whenever you want if you don't want to see the "Congratulation!" screen. Q: Why don't you use Jun with Kusanagi instead of Lawfer with Dinosaur? It's right there on your path! I thought Kusanagi was better since you get it in SG. A: Kusanagi has an attack of 2990 (attack trust 40), while Dinosaur has 3000 (68). Lawfer's PWS multiplier is 8.787 (3rd best for a fighter), while Jun's is 5.625 (below average). Jun is still a good choice because his PWS does 15 hits (2nd best for SG purposes), while Lawfer's does 10 hits (3rd best). If I wanted to go for hits though, I would use Lucian definitely. Like I said though, Lawfer gets the job done and I don't need to find a weapon for him. Q: Why don't you use a second mage with Holy Wand of Telos instead of Lawfer with Dinosaur? This would allow for one less turn of buffing too. A: While Holy Wand of Telos would be a bit better, and the lack of Great Magic actually means the PWS takes a couple seconds shorter than Lawfer, Telos is just way out of the way. It's not worth the time it takes to get. Q: Why does Lenneth start with practically no HP? A: This roughly doubles the power of Levantine from 2200 to 4400. Q: Why don't you use the Glance Reviver? -or- Why don't you use Freya? A: For SDA, a SG run starts from the Seraphic Gate option in the menu and not continue. So all preparations need to be done in the main game. Q: Should you have a different attack setup somehow? Your current one looks a bit weird. A: I actually went through many setups trying to find one that would allow everyone to PWS before they moved back to their starting positions. This one is a little funky and misses hits, but I went into the practice mode, tested it repeatedly, and it works 100% of the time. Q: Why don't you reorder High Wind 3rd so Arngrim uses it instead of Wrenching Swing? Or use a move for Lawfer that is faster than Triple Thrust? A: I had no idea until I tested it recently (although it might just be my bad memory again), that it actually doesn't work that way, and you have no control over what move you get with a one-hit weapon. Q: Why do you have Noble Elixir set in Auto Item? It just wastes time, and the chances that it actually helps you are low. A: Noble Elixir is in there JUST so I don't get stuck not being able to Charge Break. This happens most of the time; like if Arngrim used Guts, the run would be over. If it weren't for that, I would only carry 2 Noble Elixirs and then use them before Iseria Queen. Q: Why use Throw against Gabriel Celeste? Why not Auto Item like you use against Iseria Queen? A: Noble Elixir only hurts the Gabriel Celeste fight. What happens is, if Gabriel hurts someone enough (either Arngrim or Lawfer), then Noble Elixir will trigger. Then Levantine won't be good enough to kill in one PWS chain. Q: Does Sap Guard make a big difference against Iseria Queen? Her RDM is not really that high to begin with. A: The reason I use Sap Guard at all is because otherwise I have to use 3 PWS chains to kill. But I don't need 2 chains of Sap Guard because that's overkill. Using it in the down turn lets me save a turn of Iseria Queen attacking. Think of it like, 2 buffs aren't enough, 3 buffs are too much, so I use 2.5 buffs. Q: What about putting Mystina 4th in the PWS chain against Iseria Queen? This would do slightly more damage. A: This one slipped by me. I always knew that Mystina does more damage, but I was under the impression that Lenneth could only go 3rd with a bow. I tested both by energy and hits, but I was wrong; Lenneth's level 3 sword Nibelung Valesti does add 10 hits and 65 energy. I tried Arngrim 3rd against Gabriel Celeste with Mystina using Shadow Servant (Meteor Swarm is 5 secs faster than Celestial Star), but since it barely wasn't enough, I went with Mystina 3rd with Mystic Cross. I would try again with Mystina 4th using Shadow Servant for both fights. Q: Why did you pause after Gabriel Celeste? A: Believe it or not, the slight pause is in the game. Q: On the way out, on the second "floor," why didn't you slide while falling down that once? A: The slide's momentum would carry over to the next screen and propel Lenneth away from the door, so it's slower. Q: Are there any tricks you wished you could put in the run? There are a couple tricks with the platforming too. For those island platforms with the chains between them, you can actually bypass the chains and just jump from platform to platform, but the risk/reward isn't worth it. Also, in the standard 3-platform rooms where you have to go from the lower right to the upper left, it's possible to do the whole room without pausing, but that's also a poor risk/reward situation. The final thing is that I had ideas for all sorts of exotic equipment, spells, characters (mainly based on PWS time which I include below), but out of necessity, I use the relatively boring Lenneth/Arngrim/Lawfer/Mystina. I was hoping to get Suo, or god forbid, Kashell in there somehow.